It’s a common complaint of many families these days. Everyone is involved in so many activities that itís hard to come together and enjoy time as a family. Consider some of these ideas on how to enjoy a fun family night in instead of everyone going their separate ways. Scientifically it has been proven that families who eat meals together are more emotionally connected and more stable. And since everyone has to eat, why not start your fun family night in by cooking a meal together? Family meals donít have to be elaborate or tedious to prepare. They can be as simple as cooking hamburgers, having chips, and drinks. Of course, you may want to prepare something that will get everyone involved in the cooking process. Someone can cut up vegetables, someone else be in charge of cooking the dessert, and another person in charge of the main meal. Have everyone pitch in and the work will be completed quicker. You can also use the time to reconnect and talk about whatís happened in each personís life since your last family fun night. Once the meal is complete, take time to set a nice table and eat there rather than in front of the television. You can make clean-up a breeze by using disposable plates and napkins if you like, but you can also make the dinner seem more special by using nice place settings which are normally reserved for holidays. 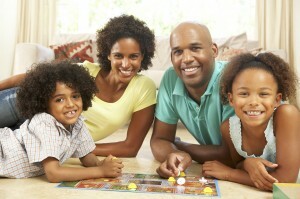 After youíve eaten dinner and cleaned up the dishes, continue your family night by playing board games. Have everyone choose one of their favorite games and then decide together which one youíll play first. Games are meant to be fun and relaxing, so try to avoid becoming too competitive if thatís your personality. Depending upon the game youíve chosen, you may be able to play more than one game; and donít forget to play games even the little children of the family can enjoy. If games arenít your favorite things, you can also plan a movie night. Find a movie everyone will like, or at least tolerate, and pop some popcorn. Comedies are usually a good choice even though people have different senses of humor. Unless the humor is extremely dry, everyone in the family should at least get a chuckle out of the movie. Pull out the family albums and take a stroll down memory lane. Remember the way the children were when they were young. Everyone loves to look at pictures of or hear stories about themselves even if they can be slightly embarrassing. Talk about some of the things your children did as babies or toddlers that you found so endearing.